Just before the sun lifts its head from its pillow and gets ready for work every morning, I hear birds start talking to each other. I live just across the street from the edge of woods, so I hear a variety of different birds. Over the past few weeks, crows have dominated the sunrise talk show. At the start of summer, robins announced dawn. Midsummer, the morning began with a blend of bird songs: robins, cardinals, sparrows, finches, chickadees, crows, etc. Each summer is different. One summer, I never heard a robin in the morning; it was all crow caws, all summer long. Another summer, the mixed melody prevailed. Blue jays’ voices were loudest another summer. It’s never the same. Take the blue jays, for instance. It’s like they’re calling attention to themselves with raucous attitude. They’re not seen without being heard. I love their black, white, gray and bright blue feathering. Up until last week, though, I hadn’t seen a half-dozen of them. Now they’re back. It’s the opposite story for cardinals. They’re always around, but much more so this season. The red males perched in greenery stand out stunningly, and their constantly varying, sliding-whistle call is unique—musical, in fact. The females’ plumage is dusky, and their calls are as subdued as the males’ are spectacular: subtle, short cheeps that blend into the background for people without birders’ ears. All flying things, not just birds, come and go during different summers. Yesterday, for the first time since I don’t know when, I spotted a sulfur butterfly. These were common when I was a boy. With their wings folded, sulfurs are a little larger than a nickel and a little smaller than a quarter. As the name suggests, they’re yellow, about the same shade as pineapple. A little later yesterday afternoon, I spotted another butterfly that took me back to my boyhood: a cabbage butterfly, which is a solid-white version of the sulfur. When I was a boy, I used to try to catch butterflies between my thumb and index finger, but they eluded me. Sulfurs and cabbage butterflies were too common to keep my attention. But swallowtails? That was different. Tiger swallowtails were most common. They look like you’d expect with a name like that, except for the back edges of their wings, which are flecked with electric blue and red. 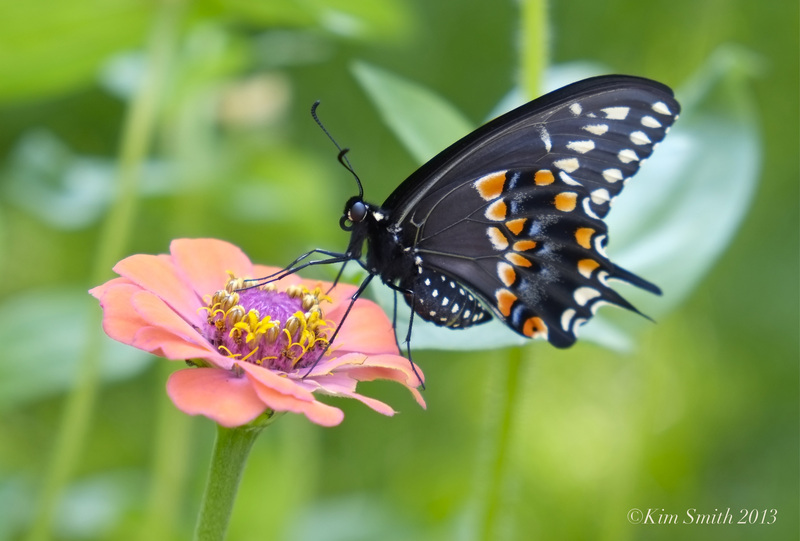 Another variant, the black swallowtail, has dark wings that look the same as the Tiger’s at the back, but the edges, front to back, are marked with a line of white dots, and the undersides of the black swallowtail’s wings are spectacular, glowing with splashes of orange and blue. Another kind of butterfly I used to see a lot, but not so much this summer, is the monarch. It’s probably the butterfly people know best, with brilliant orange wings contrasted with black. One fall day I saw four Monarchs fly one by one, about three minutes apart, about 20 feet over my back porch along the exact same flight path, headed due southwest to places as far away as Central Mexico. It’s all part of a complex reproductive cycle. Hummingbirds also make a trip South each fall, flying to Central America’s warmth. They’re starting to show up in numbers at nectar-rich flowers in my backyard so they can fatten up for their flight. I never tire of their acrobatics as they flit in mid-air from blossom to blossom. Paying attention to the natural world is the only way to spot these trends. Some people watch birds and butterflies. Others see yearly changes in their flowerbeds and vegetable gardens. Others note seasonal differences while wading trout streams, where fish, birds, animals and plants tell their own stories. To appreciate this bounty, all we need to do is open our eyes. I think we're happiest when sitting in the back yard, watching the comings and goings of all the birds and butterflies to the feeders and flowers, listening to their conversations. Nice post. Agreed - I try to spend an hour alone in the yard each morning before sunrise. Today I listened to a raccoon forage through the laurel hedge. Thanks for sharing this post. Early morning is an even better part of the day than twilight. With my sleep habits, though, I don't see it much. Maybe I can try it once school starts up on the 31st, because I have to get up early anyway, seeing as how my first class is at 8:30.